Juno has been my foster dog for just over two months. It is my first time as a dog foster Mom and I can truly say Juno has made it easy. Juno is the sweetest dog … she loves to lie on the couch and actually puts her head on your shoulders and her paw around you to hug while she naps. She is very low energy and spends a great deal of her time snoozing on her multiple beds – when she does want to play she grabs a toy and brings it over to you. She will zoom about and play bow and play catch for about 10 minutes and that it’s – back to napping!! Juno’s favorite thing in the world is people. 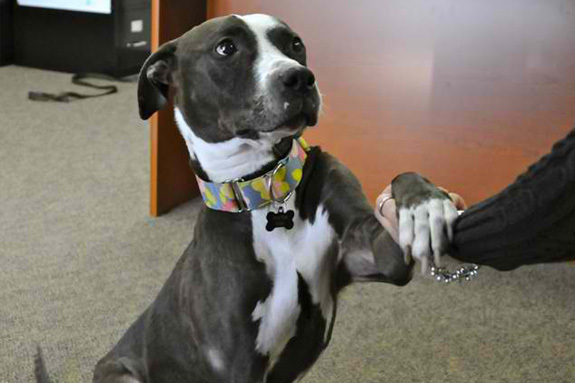 She comes to work with me every day and has had the opportunity to meet folks ranging from a few months old to those well in their 8th decade – with everyone she makes instant friends and will sit for pets as long as hands keep petting. Juno is on the big side – about 65 lbs. but she is very gentle. If someone new visits my office she grabs a toy and goes and sits in front of them – I believe it is her way of saying, “Hello, New Friend, I’m glad to meet you!”. Juno does great in the car and already knows to go stand by the garage door when I tell her it is time to go to work. Juno knows sit, give paw, high-five and we are working on other skills in the Pit C.L.A.S.S. we are taking. We’ve only gone for a few classes, but so far Juno has learned the new skills and is a great student. Since the day I took her home from the shelter, Juno has been fully housebroken. I leave her home out loose for several hours at a time and she never has any accident. At night she sleeps in her crate – and if she gets tired before I am ready for bed she goes into her crate burrows under her fleece blanket and puts herself to bed. 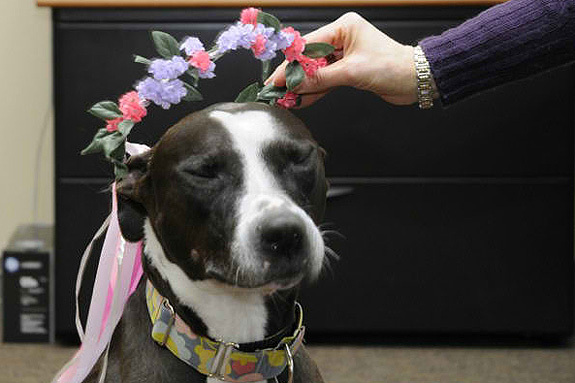 Sweet Juno is a 4 or 5-year-old pit bull mix that was taken into the shelter as a stray. 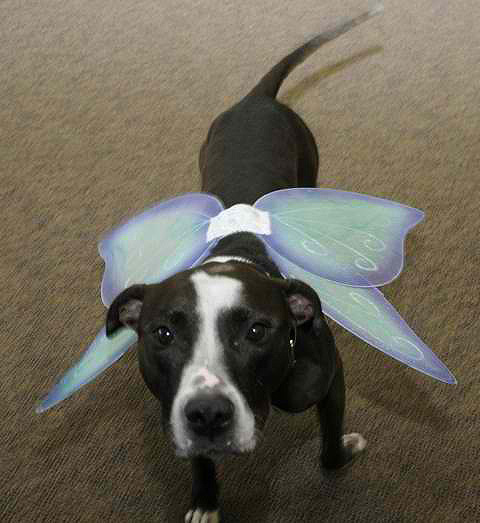 Juno was at the shelter for several long months and became depressed. She stopped eating and was becoming more and more dejected. Now that she is in a foster home, her appetite has returned and her true personality is shining through. She knows sit, give paw, stay and is crate trained. Juno’s favorite thing in the world is people. She is a very calm dog who will spend hours just cuddling next to you on the couch. 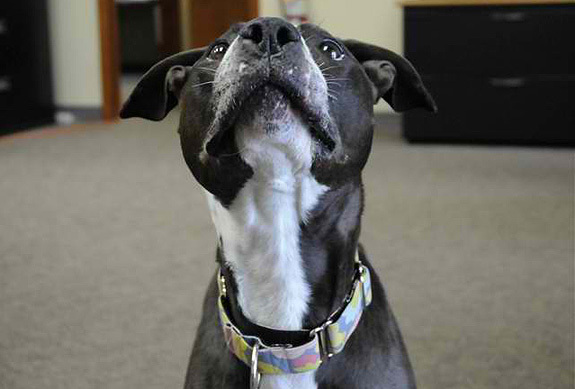 With her foster family, she comes in contact with many people of all ages and loves everyone. She is also does fine with the cats at her foster home. We are so happy to give this deserving girl a chance to find her family. If you are interested in adopting Juno, please fill out an adoption application here. Please specify that you are applying for “JUNO AT HANDSOME DAN’S RESCUE” to ensure that you application gets to the correct person. Once received, your application will be emailed to the foster family who will contact you. Thank you for choosing rescue! You can check Handsome Dan’s Rescue out on Facebook. 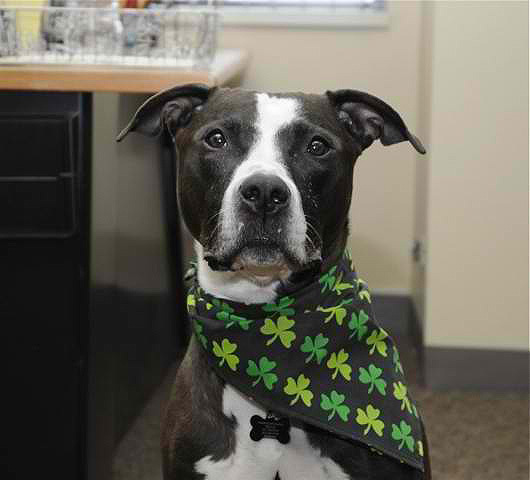 Handsome Dan’s Rescue is located in Providence, Rhode Island. 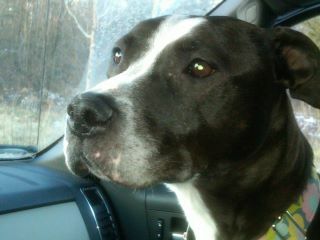 Juno’s foster mom is Trisha Torres and can be reached at [email protected]. Awww! My little grey female pittie is names Juno also! I hope she finds a good home. Sounds like an amazing dog! Hope she finds her forever home soon.